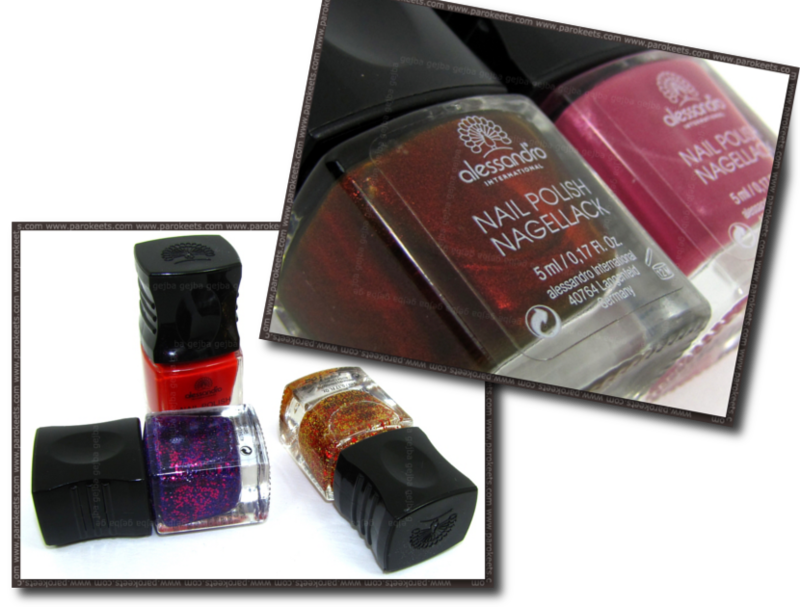 Polishes from Alessandro Adore Me and Enjoy Me limited editions seemed like interesting combinations, so I merged two reviews into one. My first thought about Enjoy me LE was that promotional photos looked nothing like the actual nail polishes. And contrary to usual situation, nail polishes look dull on the promo photos and vibrant in reality with depth that immediately drew me in. As two of the nail polishes are glitter layering ones, I used Alessandro Adore Me shimmery ones as a base. 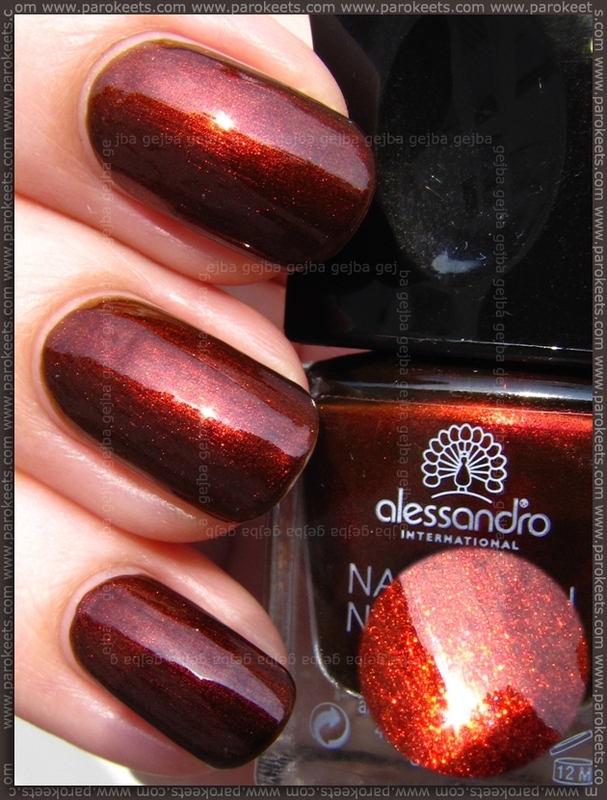 Alessandro Luscious Brocade from Adore Me was one of the most awaited fall shades for me. And I was not disappointed after I finally got the chance to try it out. Good coverage and easy to work with formula in rich brownish red tones. 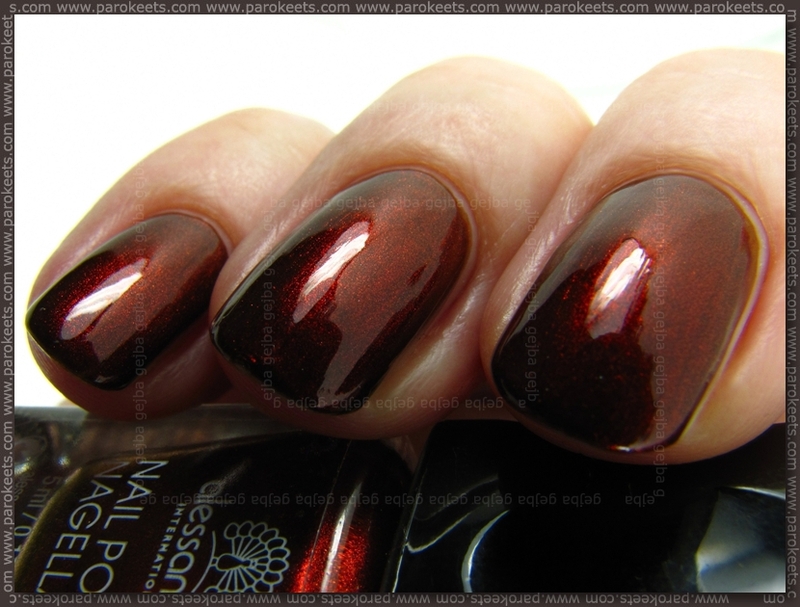 Duochrome effect is not prominent, but it does add to the depth/complexity of the polish. … and one taken is few minutes sun was shining through the clouds. 2 coats + top coat. I upgraded it with one layer of Alessandro Enjoy Me LE – Carnival in Rio. I thought this one was very similar to Essence Gold fever, but it’s not. Carnival In Rio has a lot bigger glitter and color combination is more obvious. But the major difference is in the coverage – Carnival is loaded with glitter and as it’s bigger – you get a lot better coverage. I used one coat on the bellow photo. 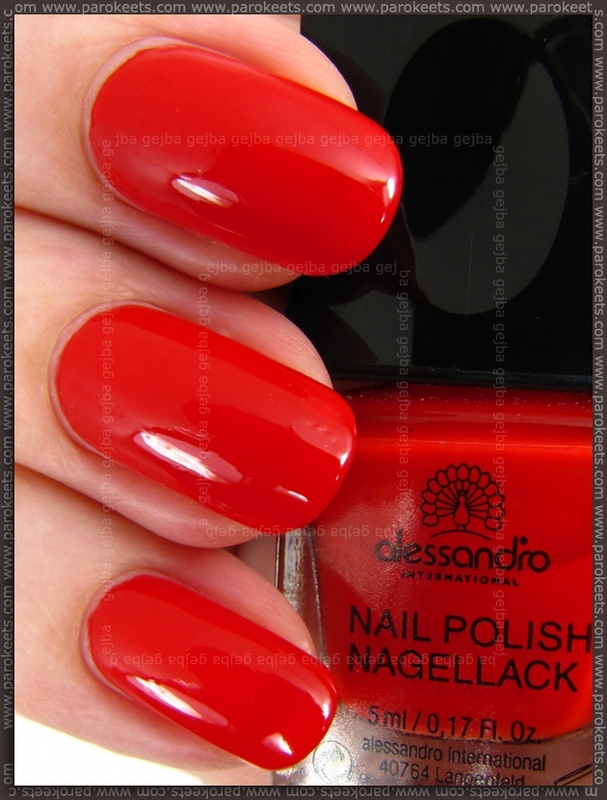 Alessandro Dramatic Blossom from Adore Me LE was the next one on the list. Shade itself is colorful and elegant, but I did not like it much on me. Maybe it’s touch to cool for my skin-tone? Something bothered me in any case. Shimmer is really fine and not seen much … main role is to avoid nail polish looking flat. Application was perfect, if you have steady hand you could possibly get away with one coat as pigmentation is very good. 2 coats + top coat. I wore this one only for few hours and then layered Brazilian Night from Enjoy Me LE over it. I was very nicely surprised with this shade. 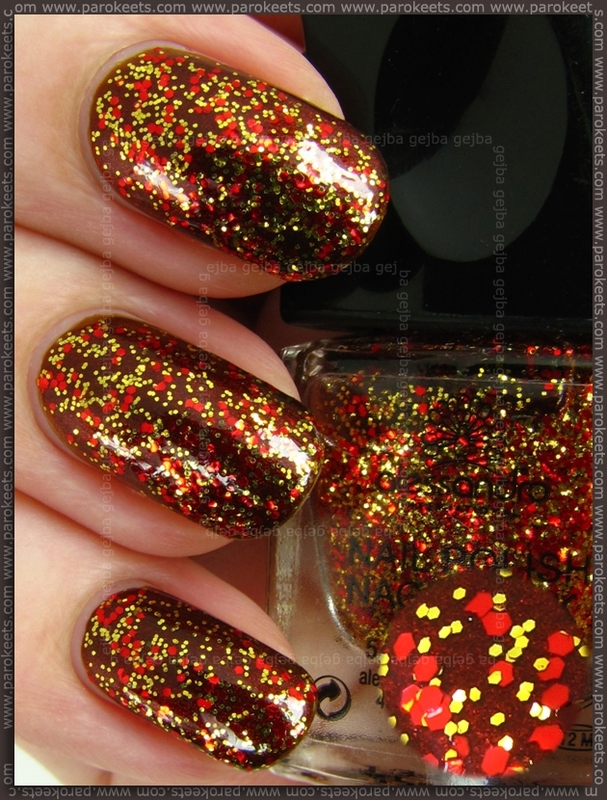 It looked meh on promo photos, even in bottle did not look like it would be stunning, but on nails … WOW. I would never ever think I would like combination of smaller cool purple glitter and larger warm colored particles, but I was blown away with this shade … and I’m thinking of buying backup. Take a look at how much coverage you get with one coat. Alessandro Latin Lips from Enjoy Me LE is easy to apply, goes from slightly more warm to cooler undertone but generally speaking is true red nail polish. It has slightly jelly finish so you don’t get 100% coverage with 2 layers, but if you’re not fussy about nail line, one coat is enough. I spiced up this shade with white dots from one of new Essence image plates. All nail polishes dried fast, but not while still applying it. Glittery ones needed 2 coats of top coat to cover up the grittiness. I removed glitter nail polishes with foil method. 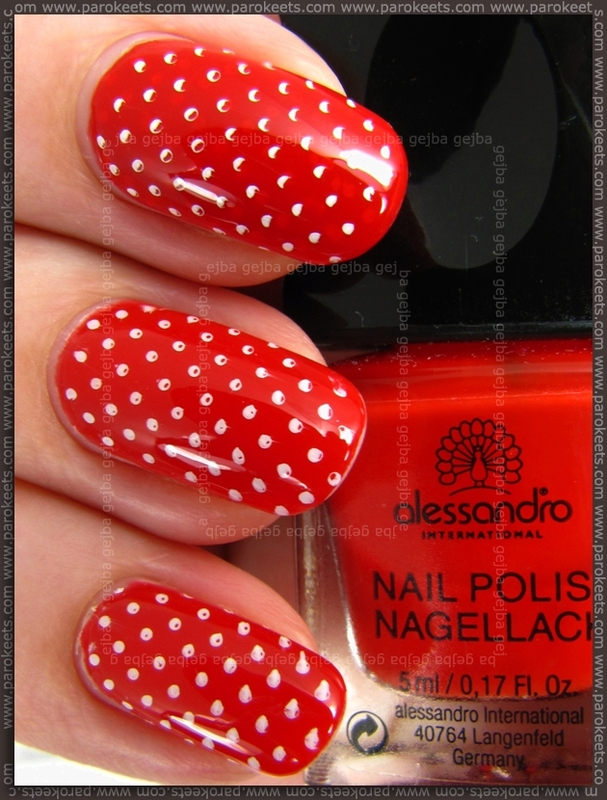 Hy, I am trying to find a dupe for a Alessandro nailpolish from a limited collection. It’s name was cappuccino. Do they have it in a bigger bottle but under a different name now :(? O Brazillian night predobro izgleda :drool: a ova crveno bijela manikura s tockicama mi je skroz slatka, podsjeca me malo na crvenkapicu iz nekog razloga iako se ne sjecam da je ona ikad imala tockice. Latina Lips looks so beautiful with the white dots. And the Glitters look awesome! Ne vem zakaj vedno zgrešim te kolekcije. :/ Mislim, da sem ujela samo Enjoy me in iz te ne bi vzela nobene barve (čeprav me tale vijolično-rozkast glitter spominja na eno glitter bombo od Nails Inc., ki mi je bila zelo všeč). Adore me mi je pa ušel z radarja. Luscious Brocade je fantastična barva. Bojda dobim Germanicure, ki se mi zdi izredno podoben odtenek, tako da bom še malo počakala z nakupom, tudi če ga kje najdem. LOL – poročaj kako je tebi všeč kombinacija. Ime je običajno na pokrovčku … na beli nalepki. Koliko pa je pribl. cena teh Alessandro lakcev? Jaz sem ga pustila kar na mizi … zagotovo kmalu spet pride na vrsto. the promo pictures look so different than the actual polishes! I’m not for the vampy brown/red shades, and the other ones I think I have dupes for. Hmm. Too bad!